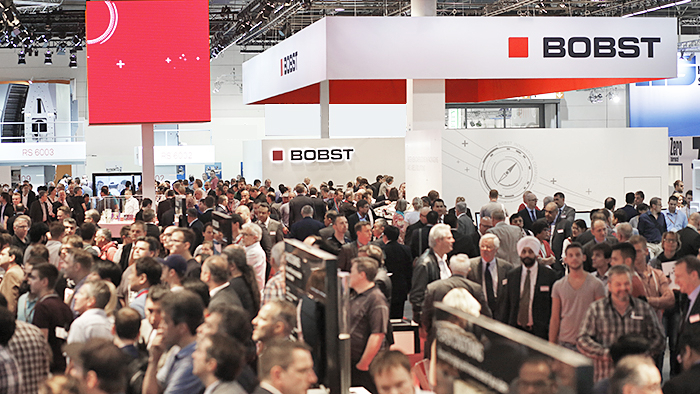 The BOBST range of equipment and services, and in particular the world premiere lines it revealed, resonated extraordinarily well with visitors to drupa 2016, resulting in sales at the show exceeding both expectations and the total recorded at BOBST’s record breaking drupa four years ago. 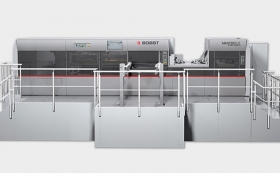 Buyers were attracted to all aspects of the BOBST portfolio, and showed particularly strong interest in the new M6 Digital Flexo press, as well as in mid- and high-range converting for sheet-fed carton manufacture and in services such as online troubleshooting. By starting from the end packaging application and working back to the ideal manufacturing solution, BOBST is unique in the industry. Its solutions at drupa addressed the concerns visitors expressed regarding how to profitably manufacture when run lengths are constantly reducing and labor costs increasing. Drupa 2016 also offered an opportunity for BOBST to celebrate its 125th anniversary with customers from all over the world. The M6 press impressed visitors with its automated systems that change jobs in under a minute, produce virtually no waste and need little operator intervention. The press gives users the speed advantages of a digital workflow along with the cost advantages of the flexo process and an Extended Color Gamut ink set. The M6 press can run flexible packaging or folding carton and, when used with a sheeter unit, allows carton makers to take advantage of Digital Flexo while continuing to use their existing sheet-fed conversion equipment. The range of flexo solutions BOBST offered at drupa were a particular success with board, label and flexible packaging manufacturers. Visitors showed considerable interest in the new MW 85F flexo press, which delivers high quality, low waste production and is particularly suitable for short-run printing. The interest from visitors confirmed that the MW85F, and the larger MW 125F, are the right solutions for the market. In the super-wide CI flexo arena, the new 40SIX model, designed for print widths over 1650mm and up to 2250mm, delivers fast and fully automatic job change-overs with safe and easy sleeve handling. Visitors interested in the gravure process offered very positive feedback on the high speed, high quality printing solutions BOBST offers, especially the new RS 6002 and RS 6003 presses announced during the show. The RS 6002 is an eco-friendly press that handles short and long run production of flexible materials applications equally efficiently. The RS 6003 is an evolution of the very successful 4003 platform and is ideal for medium-to-long run lengths, while accommodating both shafted and shaftless printing cylinders. Converters were particularly interested in the new CL 750D laminator which premiered at the show, and which offers them a way to access new markets such as that for ultra-short run laminating. The CL 750D is the result of many decades of experience, making BOBST quality lamination solutions available in a compact, easy to use and competitively priced machine. 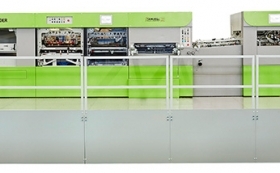 Both the MASTERCUT 106 PER and new MASTERFOLD 110 premiered at drupa surprised customers with their advanced technical solutions which make them the most productive machines in the market. Higher running speeds, much faster make-readies, less waste, increased uptime, and technology that makes ‘zero-fault’ production achievable, all addressed users’ needs for increased automation and the ability to change jobs quickly and accurately. The industry’s most productive MASTERFOIL 106 PR hot foil stamping press on show, which features a new module, FOIL UNWINDER+, made a successful drupa debut as well. Along with these high productivity solutions, mid-range solutions such as EXPERTCUT die-cutters, and EXPERTFOLD and VISIONFOLD folder-gluers were in considerable demand by visitors to the BOBST booth. 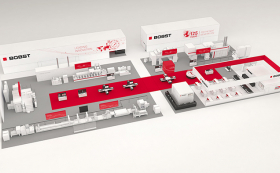 The very center of the BOBST booth at drupa 2016, which itself was described as having a ‘great design’, being ‘very user friendly’, and delivering a ‘high-class display of technology yet with a human touch’, was reserved for service and innovation products. This position for services reflected the BOBST commitment to become the benchmark for service provision in the industry. Customer interest resulted in a large number of handshakes on services investments that increase uptime, including Helpline+ remote troubleshooting installations, Maintenance+ programs for peak equipment performance, and Platen Conditioning programs that reduce make-ready time by up to 50%. Further substantial sales included transformations to food-compliant lubricants, Impact CAD systems that allow customers to create tooling more quickly, and oil cleaners that extend oil life and reduce the need for oil changes. Reflecting its ability to take customer applications and produce highly productive systems to manufacture them, BOBST and a group of partners came together to create the Elevated Drink Box - an innovative new ‘bag in box’ concept that was demonstrated for the first time at drupa 2016. This easy and convenient way for consumers to enjoy beverages was created by combining the expertise of BOBST, Metsä Board, Kodak, Henkel and Marbach, and was featured during drupa’s Touchpoint Packaging sessions. More than 500 customers visited the Bobst Germany Competence Center at nearby Meerbusch, where additional equipment was on display, while several customers also undertook visits to the beta sites for the BOBST Digital Press for Corrugated Board. The feedback received was very positive and customers see BOBST as very much progressing in this technology.